The fashion world is a platform that prides itself on its delineation of progressive inclusivity, global culture and idiosyncratic sartorialism. Yet, there is one controversial area that still dominates headlines in the UK industry. Diversity is still a matter of great social, political and economic concern for many inside and outside the fashion forum. 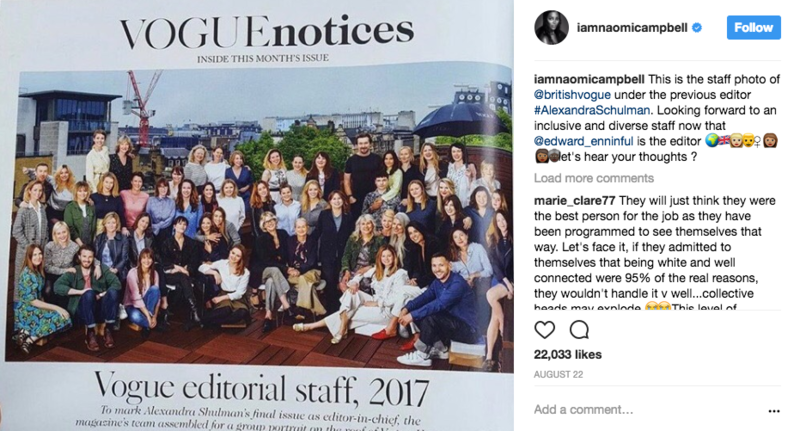 In August 2017, in the midst of British Vogue Editor Alexandra Shulman’s departure, supermodel Naomi Campbell publicly lambasted the fashion bible, after a staff photo depicted not a single black or ethnic minority member. Even though the recent appointment of Edward Enninful as editor-in-chief of British Vogue is seen as a step to modify the image of the publication, from boardrooms to the runways, it seems that lack of minority representation is a recurring theme in the fashion debate. Some of the fashion industry’s leading models are from black or from ethnic backgrounds, but it still seems that minority representation is a looming issue. So what exactly are the factors that are the root cause of this rampant dilemma? The evidence is overwhelming. In the past, designers have been in the spotlight for discriminating against minority models. Dolce and Gabbana, Gucci and Givenchy have all been in firing line for lack of diversity on the runway. Lanvin was embroiled in a racism row in 2017 during Paris Fashion Week, after well respected casting agent James Scully blasted the brand for allegedly refusing to showcase women of color in its runway show. This public lashing ended with Lanvin in fact, featuring four models of color out of the forty-four it showcased. British influencers such as Neelam Gill, Jordan Dunn and Leomie Anderson have all added their voices to this conversation, about how an absence of black and colored women at the fashion forefront has led to discontent, most notably the problem of ethnic ‘tokenism’. ‘Tokenism’ is an industry practice where designers seek to fill diversity quotas by hiring a small number of individuals from under-represented groups to allude to the appearance of equality in fashion. In the past designers such as Calvin Klein and fashion power house Dior have been publicly admonished for their open practice of tokenism. Dunn and Iman’s personal experiences of being discriminated against on grounds of colorism outline a key point: Women of colour are still largely seen as an ‘invincible’ faction and not a wholly lucrative market worth investing in. The evidence speaks for itself. The Fashion Spot reported, that in fall’ 2017, there was a minute improvement in casting non-white models. Out of the four main cities examined, London, Paris, Milan and New York, 72 percent of the models were white, whilst 27 were women of color. This is an increase of 2.5 percent from the previous seasons in 2017. However, the progression is moderate. So what exactly are the perils for the fashion industry in the long term, if diversification is not set as a future priority agenda? Essentially, the responsibility to further diversity in the fashion industry lies on the shoulders of those who have the power to shape positive discourse surrounding minority representation in the industry: designers, editors, magazines and fashion councils. For example, the UK is one of the most cosmopolitan nations in the world, and its rich heterogeneous melting pot of cultures is reflected throughout the creative industries. The contributions made are invaluable. In 2017, Gucci saw its profits soar 50 percent, after reinvented itself by discarding its iconic logo and opting for a more bold approach to print and aesthetics. Gucci sought inspiration from granny chic, vintage and African tribalism. To disenfranchise certain communities will limit the fashion industry in scope and depth for innovation. The fashion world also needs to adapt itself to evolving markets of representation. It needs to take into consideration not just the race factor, but also broaden its horizons in terms of beauty standards. In the last few years, there has been a significant political paradigm shift, and more minority voices on social media have risen to prominence. Digital influencers such as Nadia Aboulhosn and Tess Holliday fly the flag for plus size models, whilst model Winnie Harlow empowers vitiligo sufferers, and models such as Halima Aden is the first Muslim hijab to walk the high fashion runway, most notably Maxmara and Kanye West. The fashion industry must expand the conversation surrounding the examples that these game-changing women have set. To move forward, fashion insiders must now create a new strategy in place to debate diversity. If not addressed properly, publications such as Vogue are in the tenuous position of risking their reputation if they create an image of inclusive fashion liberalism, yet contradict their message by appealing to only an exclusive coterie of the upper echelons of society and diluting minority voices. This entry was posted in Lifestyle and tagged Conde Nast, Edward Enninful, Naomi Campbell, vogue. Bookmark the permalink.